The honeybee`s wings are fine gold thread, and it is hard to see on the scan but the snail shell is outlined with gold thread as well. Flowers depicted are the rose, gillyflower (carnations today), heart`s ease (pansies) and forget-me-nots (in blue). Peapods were popular, as were strawberries. 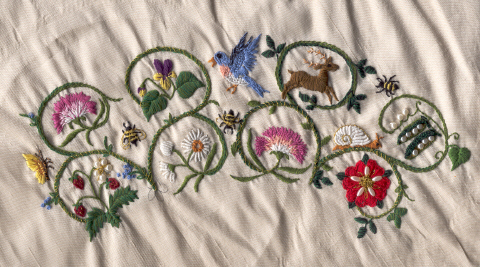 The green vines are stem stitch wrapped with gold thread, most of the birds, flowers, and animals are split stitch, the red rose is satin stitch, and the daisies and snail shell are bullion stitch. I used various motifs commonly found in Elizabethan embroidered pieces..flowers, animals, gold thread and pearls...the pea pod was done in detached buttonhole stitch; the pod peels back to show the pearl peas. The peapods are detached buttonhole stitch, which was used in the making of needlelace--it yields a 3D effect, and the peapod top can actually be peeled back to reveal the pearl peas inside. 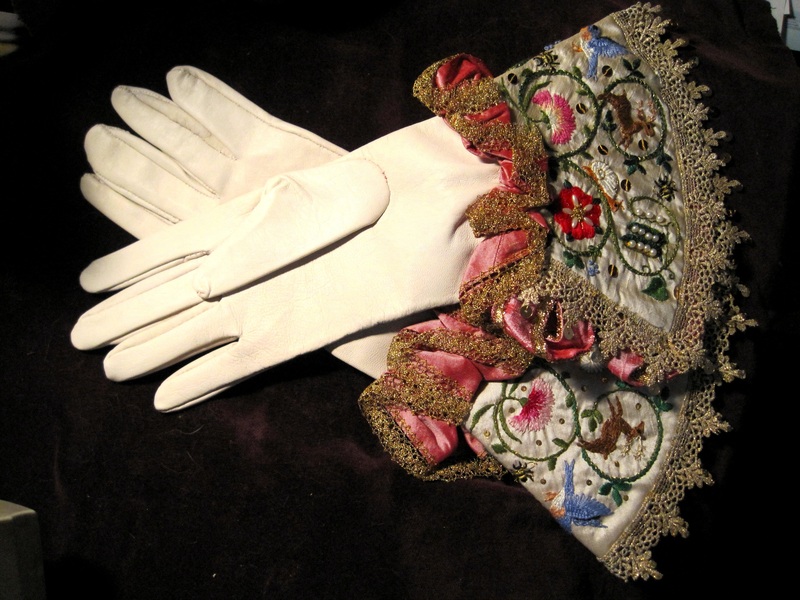 After seeing some of the historic gloves in the Victoria & Albert Museum (the V&A) I became obsessive with having to have a pair...and since my persona is Elizabethan, everything just fell together! 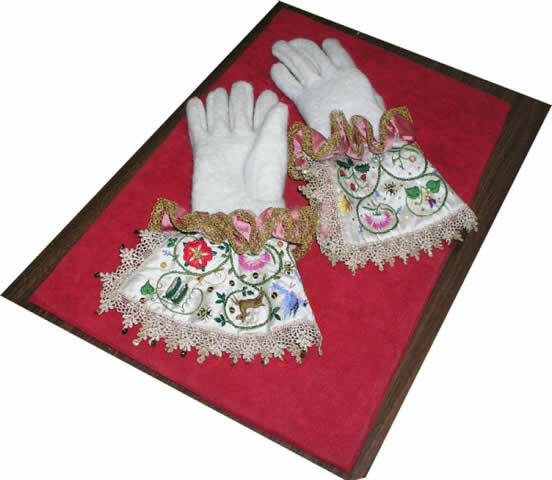 These are the wool gloves of my first attempt, attached to the embroidered cuff; the only thing missing from the finished project is the pink ruffle at the cuff seam. The gold lace edging is store-bought; the floss is cotton (it`s what I had on hand); the pearls are artificial, and further embellished with tiny real-gold spangles at the points of the lace. A&S exhibit I went and made a white leather version--it fits the cuff embroidery much better! If you`d like to know more please feel free to email me at bgable55@hotmail.com.